TS EAMCET Online Application 2019 Available Now. Aspirants can check the Telangana State EAMCET 2019 Application Process. Interested candidates can submit the TS EAMCET 2019 Application form on or before the last date, i.e., 5th April. Aspirants can go insight to get the TS Engineering Agriculture Medical Common Entrance Test 2019 details such are the Application fee, process, important dates, etc. TS EAMCET Registration Online link available from 6th March to 5th April 2019. Also, refer the TSCHE EAMCET official website that is eamcet.tsche.ac.in for detailed info on Telangana Engineering & Medical Common Entrance Examination 2019. Latest News: TS EAMCET 2019 Application Form has been Released. Apply for EAMCET Exam through the Link Attached Below. 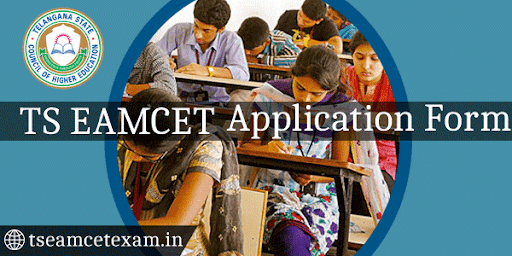 1.2 How to complete TS EAMCET 2019 Apply Online? Telangana State EAMCET Application Process Available here. Candidates can obtain the complete TS Engineering Agriculture Medical Common Entrance Test Online Application Steps on this page. We have provided detailed information about the TS EAMCET Fee Payment Gateways, Fee Process, Registration, Application Submission & Verification, Printout of TSCHE EAMCET Application Printout. Along with all the information, we have also provided the direct online link to the TS EAMCET Application form 2019 Steps. Candidates must complete the TS EAMCET 2019 Online Application Process before the last date. Every Year, Telangana EAMCET Exam is conducted by the JNTUH for the Entrance in the Engineering Agriculture Medical Colleges of Telangana State. The TS EAMCET Online Application 2019 process starts in the month of February 2019. EAMCET Telangana State Council of Higher Education will activate the link for Telangana EAMCET Online Application in March 2019 and this Link will be Activated until April 2019. The TS EAMCET Application form 2019 is available here with complete information. The Instructions to be followed by the Candidates to apply for TS EAMCET 2019 available below. Aspirants should check the Telangana EAMCET Notification for details regarding the Application Fee, Eligibility Criteria, Exam Dates, etc. to apply for the TS EAMCET Exam. Before filling the Eamcet 2019 Online Application, you need to follow some important Instructions to overcome the difficulties during the application submission. And before proceeding with the Online TS Eamcet Application form 2019 the aspirants should be ready with all the documents that are required to upload. You must read the Instructions carefully to know the details about the required documents. The total application process for TS EAMCET 2019 Exam is available below. How to complete TS EAMCET 2019 Apply Online? Candidates who have no idea about the TS Online Eamcet Applications can follow the ease of Application submission. Download the Information Details and Read the Instructions carefully. You must be ready with all the documents of the scanned copies of required documents ready before filling online application. Click on the Fee Payment. Pay the TSEAMCET Fee Payment through the possible gateway. With Transaction Id, Payment Reference ID, Password login to the application registration. Fill the Application with the complete details carefully. Upload Scanned Copies Photo, signature, and left-hand thumb impression & self-declaration. Submit the Application and Download e-Challan. Finally, make Payment and Take Printout of Application. The candidates who are applying for the TSEAMCET 2019 can carefully fill and submit the Online Application from the enclosed link. Below, we have provided the Steps by step process to apply online for TS EAMCET 2019. To apply for the TSEAMCET 2019 Exam, candidates can visit the official website that is www.eamcet.tsche.ac.in. The first step in the EAMCET TSCHE Application process is Fee payment. For that click on “Apply Online” the top of the homepage of eamcet.tsche.ac.in. Applicants can pay the TS EAMCET Exam Fee in one of the following Two Ways. APOnline/ TSOnline/ E seva: Candidates can pay the Exam Fee TSonline/E seva/Online. For this gateway, candidates click on the “Click Here if paid through TSONLIne/APOnline/Mee-Seva” option. Firstly select the paid through mode. Then enter your transaction Id. Enter your name, father name, mobile no, date of birth (as per SSC Certificate) details. Give your qualifying exam hall ticket no. Finally, enter your SSC Hall Ticket No and then click on “proceed to online application form filling. Debit Card/ Credit Card: Candidates residing outside India can Pay the Application Fee through Demand Draft. The Demand Draft must be drawn in favor of “”, payable at Bangalore. Candidates must note the Payment Reference No first. Then enter the all required details. Then proceed to the Make Payment. To Complete the TS EAMCET Online Application form Submission, candidates need to pay the Application through one of the above-mentioned Options. The Application Fee for various Category is available below. Applicants residing outside Karnataka: Rs. 1,000/- (General) & Rs. 500/- (Reserved). Click on the enclosed link and choose your State, District, & Mandal to know the payment centres nearer to you. Candidates should be made ready the Scanned Copies of the photo, signature, left-hand thumb impression, and father’s/mother’s/Guardian’s signature. All the scanned copies of images should be in jpeg/jpg format only. The Image Size of Scanned copies should not be more than 40KB. The Image Dimensions of Signature and left-hand thumb impression should be 3.5 cm x 1.5 cm only. For Apply Online TS EAMCET Entrance Test, Candidates should first complete their Application Fee Payment. On Completion of payment, they can apply for the TS EAMCET Exam using Transaction Id, Payment Reference Id, & Password generated at the Time of Candidate payment. During EAMCET TSCHE Payment, candidates should give their personal details like name, father’s name, mother’s name, date of birth, etc. to create a user id. And while filling Registration Form, you need to fill the field of Secret question and answer. Applicants should remember this Question & Answer because this secret question would help them in regenerating their password if they forgot their Password. Note: This step is for the candidates who have paid through Debit/ Credit Card. First of all, enter Payment Reference Id, Transaction Id, Qualifying Examination Hall Ticket No. Fill the application with the correct details. After Completion of Registration can Login with their User Id & Password to complete the Application at any time. In the second step of Online Form Submission, candidates should enter all details all details mentioned in the two forms. The Two forms include Student Information and their educational details. In student information, candidates had to fill the fields like mother tongue, contact details, reservation category (if any), annual income, postal address for the communication, etc. And in Education Details, candidates need to fill in all the details related to their Educational Qualification. In the Third Step of Registration, candidates should upload the scanned images of their Photograph, Signature, Left Hand Thumb Impression, and self-declaration. After uploading all the documents, candidates have to tick mark the Declaration tab. With this, your Application form filling and checking process completed. Now, you can submit the Application on clicking on the Submit Button. Therefore after Completion of Submission take Printout of TS EAMCET online Application for future reference and must remember their user id and password for future logins. Starting Date for Submission of Online Application: 6th March 2019. Last Date for TS EAMCET 2019 Apply Online: 5th April 2019. TS EAMCET Exam Date: For Engg – 3rd, 4th & 6th May 2019 and For Agri & Medical – 8th & 9th May 2019. Candidates must keep the Application number for their future reference. Candidates must be very careful while filling and submitting the TS EAMCET Online Application as after final submission editing the Application is not possible. Want More Details of TS EAMCET 2019 Exam? Then refer the official TS EAMCET Notification. To print out the TSCHE TS EAMCET 2019 Application form Printout, candidates click on the “Print Application” in the official website. Enter the required details and then take possible no.of printouts for further use. Not yet started Preparation for TS EAMCET Exam 2019? Now, Start Preparation by checking the below syllabus. There is very less time for the Exam. So, hurry up and Start Preparation from today itself. Don’t have enough Papers to Practice? Don’t worry Download Telangana EAMCET Previous years Model Question Papers from below Link and Start Practicing. My ROC No. 121856, I am not yet received login id to my mobile 8464026375.
sir i don’t have a inter hall ticket because i am studying in the pre-university course what should i do?